Deviled Avocado. Deliciously Devious. Sweet n Sassy. I had some leftover Vegan Cole Slaw and Sweet 'n Pepper Toasted Pistachios from yesterday's recipes. So I decided to have a little devilish fun with an avocado. A few minutes later and I had a delicious dish: a Deviled Avocado. 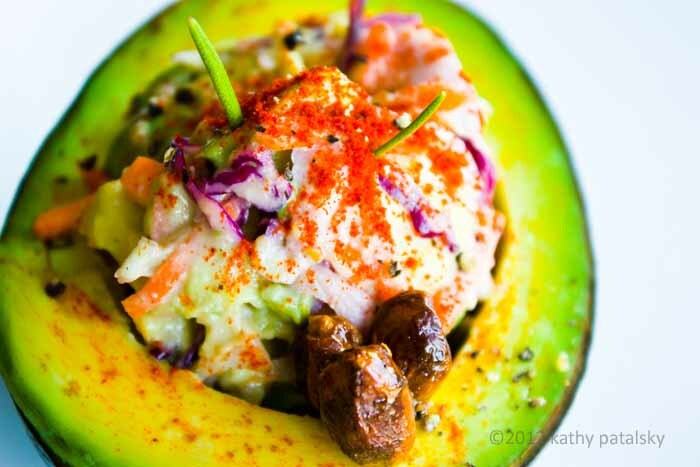 Deviled Avocado is a dish I have been dying to try. But I never knew exactly how to build the recipe. My leftover Cole slaw served as the perfect inspiration ingredient. You've heard of deviled eggs, well now the devil has gone vegan. And healthy! 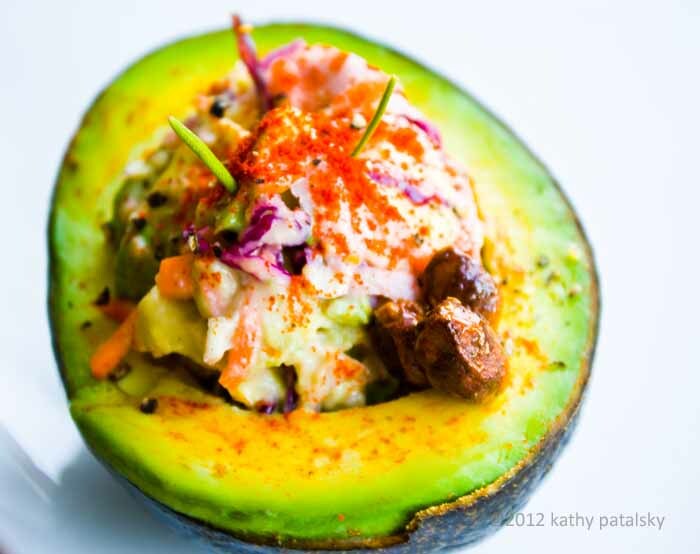 You can really stuff an avocado with all sorts of fillings, but vegan cole slaw is one very delicious option. Healthy Devil. 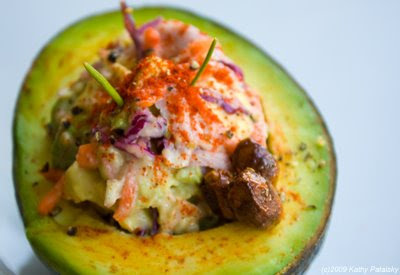 Avocados are rich in monounsaturated fats. Incredibly heart-healthy and delicious. I probably eat 4-5 avocados a week. I love them. 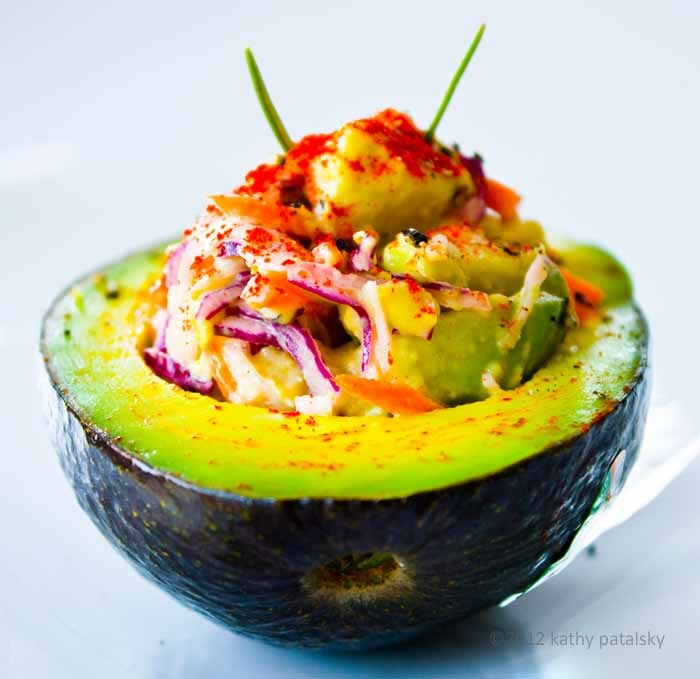 Avocados are rich in Vitamin K, E, folate and fiber. 1. Prep Avocados: Wash and dry well. Slice each in half. Remove pits, gently. Keep three halves as "serving halves". 2. With the fourth avocado half: Dice the avocado flesh. Splash with lemon juice and a pinch of salt. Set aside. 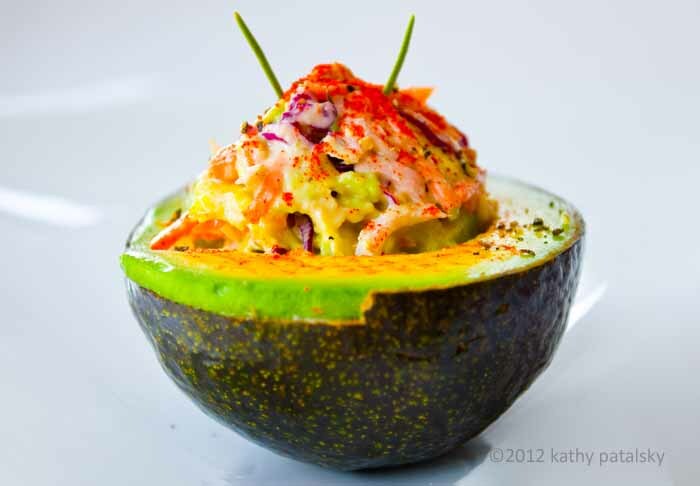 Enlarge the natural hole in the avocado by scooping out about 1 Tbsp of avocado from each half. 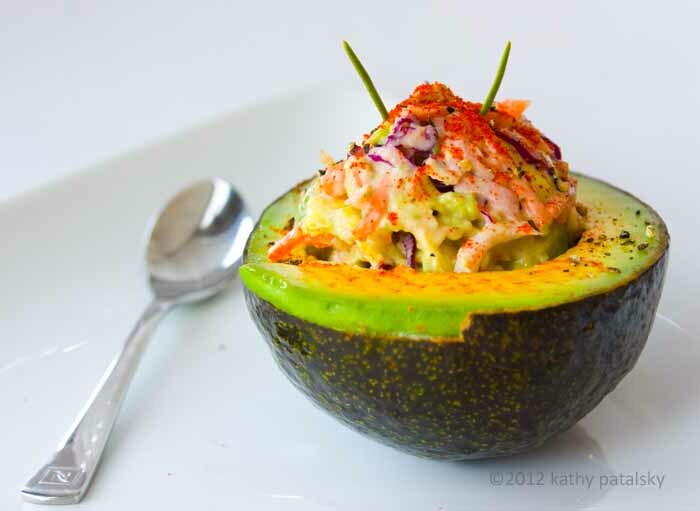 Add scooped avocado to small bowl. Add to small bowl: Cole slaw, Dijon mustard, garlic, a few grinds of fresh black pepper, 1 Tbsp lemon juice and 1 Tbsp of pistachios. Mix well. 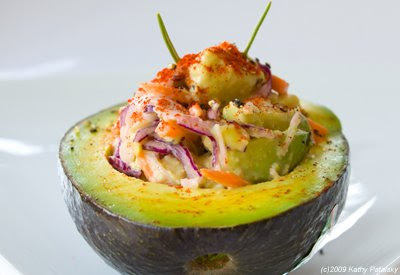 Fold in the diced avocado that you set aside. Scoop 3 Tbsp of avocado mixture into each avocado serving half. Garnish with 2-4 pistachios. Grind a bit of fresh pepper. Sprinkle a dash of paprika. Stick two rosemary "devil horns" in the top. For best taste, serve immediately. If necessary, chill until ready to serve. *Tip: Brush serving avocado with lemon juice to stop from browning. 3 heaping tbsp. Veganaise, vegan "mayo"
Add garlic powder and pepper. Allow to chill in fridge for at least twenty minutes before serving. Serve cold with fresh pepper on top. Add oil to a skillet. Turn stove heat on high. When oil starts to sizzle, add nuts. Shake pan back and forth as you 'toast' them. Add sweetener and some black pepper. Shake/toast over high heat for 90 more seconds. Make sure all nuts are coated. Toss nuts with pepper well. Pour in a small bowl. As nuts cool they will harden.